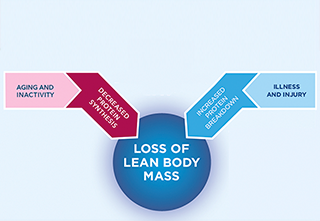 These are just a few of the many negative effects of lean body mass loss resulting from sarcopenia. 1Grimby G, et al. Acta Physiol Scand. 1982;115:125-134. 2Baier S, et al. JPEN J Parenter Enteral Nutr. 2009;33(1):71-82. 3Flakoll P, et al. Nutrition. 2004;20(5):445-451. 4Vandewoude MFJ, et al. Malnutrition-Sarcopenia Syndrome: is this the future of nutrition screening and assessment for older adults. J Aging Res. 2012;2012:651570. Epub 2013 Sep 13. 5Grimby G, et al. Clin Physiol. 1983;3:209-218. 6Larsson L, et al. J Appl. Physiol. 1979;46:451-456. 7Janssen I, et al. J Appl Physiol. 2000;89:81-88. 8Baier S, et al. JPEN J Parenter Enteral Nutr. 2009;33(1):71-82. 9Flakoll P, et al. Nutrition. 2004;20(5):445-451. 10Grimby G, et al. Acta Physiol Scand. 1982;115(1):125-134. 11Janssen I, et al. J Appl Physiol. 2000;89(1):81-88. 12Wolfe RR. The underappreciated role of muscle in health and diease. Am J Clin Nutr. 2006;84(3):475-482. 14van Bokhorst-de van der Schueren MA. Clin Nutr. 2013;32:1007-1011. 15Stratton RJ, et al. Br J Nutr. 2004;92:799-808. 16Evans WJ, et al. Clin Nutr. 008;27:793-799. 17Vetta F, et al. Clin Nutr. 1999;18:259-267. 18Engelen MP, et al. Eur Respir J. 1994;7:1793-1797. 19Nixon DW, et al. Am J Med. 1980;68:683-690.